Transoft Solutions, Inc., developers of world-leading software solutions for transportation and traffic engineering professionals, has deepened its partnership with the Institute of Transportation Engineers (ITE) through a new joint licensing agreement involving ITE’s trip generation data. 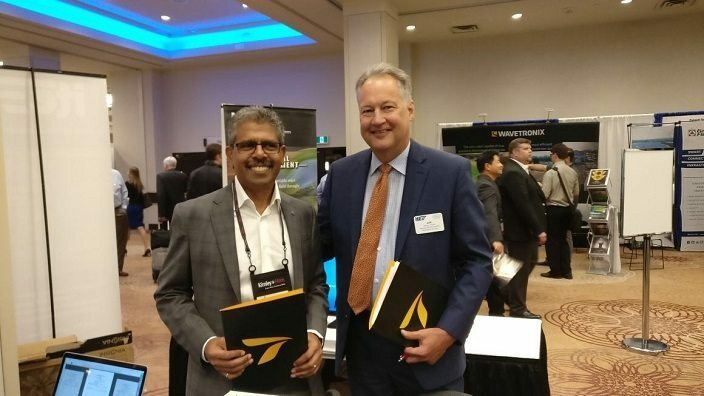 The agreement was signed by Milton Carrasco, Transoft Solutions’ President and CEO, and Jeff Paniati, ITE Executive Director and CEO, at the Joint ITE/CITE 2017 Annual Meeting and Exhibit, held July 30 to August 2 in Toronto, Ontario, Canada. The agreement signing corresponded with the release of ITE’s Trip Generation Manual, 10th Edition Bundle that was on display at ITE’s booth during the exhibit. The bundle not only features a new and improved data set, compared to the 9th Trip Generation Manual produced in 2010, but also allows purchasers to have access to the data in both hard copy and electronically, plus increased functionality through a new web-based application. Licensed exclusively to ITE from Transoft, the ITETripGen app will allow ITE’s nearly 15,000-strong membership to access its entire trip generation dataset online. Transoft worked closely with ITE to develop the app, which is a testament to the organization’s confidence in Transoft’s design team and its 25+ years of transportation engineering software expertise. The ITETripGen app has numerous filtering capabilities including site setting, geographic location, age of data, development size, and trip type (person or vehicle trips). Users wanting more advanced analysis capabilities will be able to purchase OTISS Pro software directly from Transoft as an add-on. “The underlying intellectual knowledge has been refreshed and updated by ITE, but what the app does is give the user access to that data at a different level of depth, along with the ability and the flexibility to work with the data in more sophisticated ways,” said Paniati. The licensing agreement builds on a deep and mutually beneficial relationship between Transoft and ITE that started with a collaboration between Transoft President and CEO Milton Carrasco and Paniati’s predecessor, Tom Brahms. Carrasco and Brahms saw an opportunity to collaborate in the creation of the OTISS traffic impact analysis software in 2012. OTISS draws on trip generation data compiled by ITE’s membership, and added greater functionality for transportation professionals, who use the data to predict future transportation demand and produce traffic impact assessments for land use development. Where the analysis used to be done manually using multiple volumes of trip-generation data containing thousands of pages, OTISS simplified the process and allowed transportation professionals to work with the data in ways that were not possible using only the print versions. Paniati said that the ITETripGen App builds off of the groundwork laid in creating OTISS and makes the functionality available to all users through inclusion as part of ITE’s new Trip Generation Manual, 10th Edition “Bundle.” The bundle includes the Trip Generation Desk Reference, Trip Generation Handbook, a PDF-version of all land use plots, and the App. He also acknowledged Transoft’s role in not only producing the ITETripGen app, but assisting with the assembly of the data for the 10th Trip Generation Manual. “We were able to use new Transoft-generated software tools to support the collection, review and production of the 10th Edition that allowed us to streamline the process and make it more efficient,” Paniati said. The ITETripGen app is expected to be available in mid-September. Transoft Solutions, Inc. develops innovative and easy to use software for transportation professionals. Since 1991, civil engineers and technologists, architects, and city planners across federal agencies, State DOTs, airport authorities, cities, ports, and infrastructure consultants have come to rely on Transoft’s field-researched design solutions. Transoft’s engineers work closely with the world’s leading agencies including AASHTO, ITE, TRB, TAC, Austroads, and CROW to develop highly specialized applications serving over 30,000 users across 120 countries. Transoft Solutions is committed to providing best-in-class customer support through its offices in Canada, Sweden, The Netherlands, Australia, Germany, India and China, enabling professionals to design with confidence. The Institute of Transportation Engineers (ITE) is an international membership association of transportation professionals who work to improve mobility and safety for all transportation system users and help build smart and livable communities. Through its products and services, ITE promotes professional development and career advancement for its members, supports and encourages education, identifies necessary research, develops technical resources including standards and recommended practices, develops public awareness programs, and serves as a conduit for the exchange of professional information. Founded in 1930, ITE is a community of transportation professionals including, transportation engineers, transportation planners, consultants, educators, technologists, and researchers. Through meetings, seminars, publications, and a network of nearly 15,000 members working in more than 90 countries, ITE is your source for expertise, knowledge, and ideas.